Wireless workout headphones are for people who want to block out external distractions and don’t need to hear their surroundings during a workout. You’ll need to charge them from time to time, and they’re not meant for swimming. If either of those factors are a dealbreaker for you, check out our guide to wired exercise headphones instead. And if you’re a biker or runner who needs to be aware of traffic to stay safe, you’d be better off with one of our unsealed picks from the best running headphones guide. We called in every model that met these criteria (and either had positive reviews or was too new to have any feedback) for our expert panel to evaluate. We asked each panelist to consider fit, comfort, ease of use, and sound quality of each set of headphones and to rank their top picks. Then, we brought our favorite pairs along for a workout to test how well they performed in the real world. Finally, we tested for durability by yanking the cords and exposing the headphones to water and sweat. To learn about our testing process in detail, please see our full guide to wireless workout headphones. Photo: Kyle FitzgeraldThe JLab Epic2 is our top pick yet again because these earbuds fit most people comfortably and stay firmly in place during rigorous workouts. They’re also easy to use, affordable, and very durable with proper care. And they sound great too. We tested dozens of new headphones in this category, and none of them were as pleasant to use on a regular basis. Many had huge Bluetooth transmitters that slammed against the neck when we bounced, long cables that snagged and made noise, or sound quality so terrible we literally couldn’t hear parts of our music. Once we saw just how much junk was out there, the many attributes of the Epic2 became even more appealing. 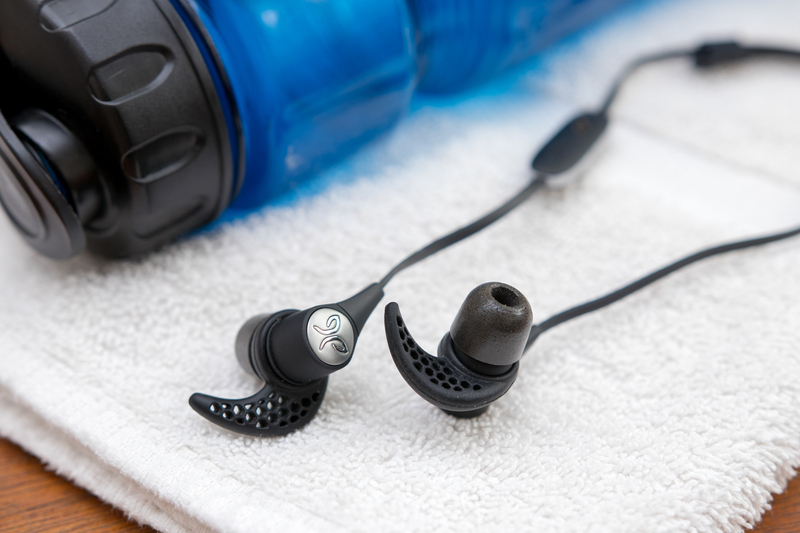 The Epic2 excels when it comes to durability: Sweat, water, and dirt are no match for these earbuds. We were also impressed with their sound quality. It had a little extra bass, but not so much that it muffled other frequency ranges; the effect was just enough that songs with a solid bassline had a little more oomph. Overall, nothing else available is as well-rounded as the Epic2. These headphones are tough, great sounding, and comfortable, so your focus will stay on completing your workout, not on fiddling with your earbuds. Photo: Kyle FitzgeraldIf our pick is sold out, or if durability is your top priority, consider the Jaybird X3. 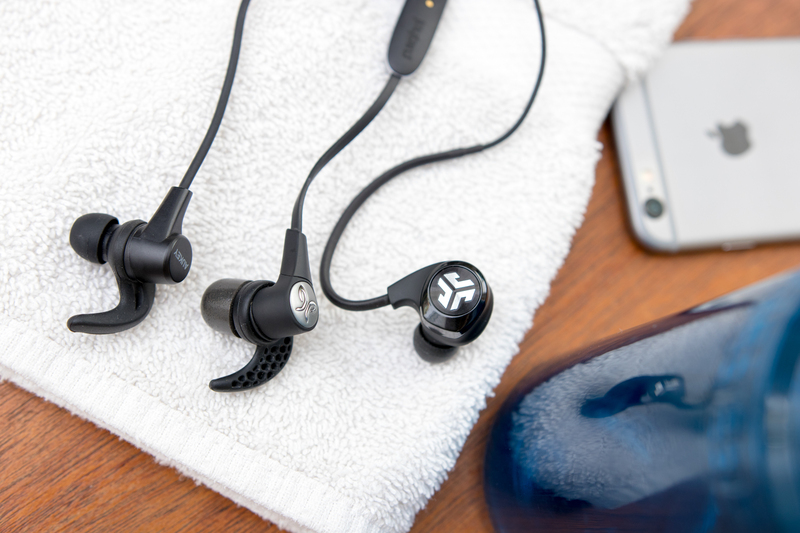 With a unique charging system that has no battery door, plus an extra-thick connector cord between the earbuds and a two-year warranty against sweat damage, the X3 is made to take a beating. This set comes with a wide variety of both silicone and Comply memory-foam tips, as well as stabilizing wings, so you can customize your fit. Once in place, the X3 will stay put through high-impact workouts. Plus, you can wear the X3 with the cable threaded over your ear or hanging down, further adapting it to your personal preferences. And in our tests, the sound quality was very good, with a slight sibilance to consonants and a little extra bass. Although the X3 has a ton of great features, it’s the downsides of those features that kept this set from being our top pick. For example, the unique charging system that prevents water from getting inside the battery requires a special adapter that’s really small and easy to lose. Additionally, there’s a bit of a learning curve involved when figuring out which wings and tips will fit your ears the best. Photo: Kyle FitzgeraldIf you’re looking to spend as little as possible without buyer’s remorse, the Aukey Latitude EP-B40 is the way to go. Comfortable for most people, durable, and backed with a two-year warranty, the Latitude bests everything else in its price range. Why? These earbuds stay in place, they’re easy to use, and they sound decent. In our tests, so many other workout headphones under $50 were uncomfortable, poorly built, or marred by piercing high-frequency ranges that made turning the volume up past 40 percent literally painful. The main downfall of the Latitude is the cable length. Although the coating on the cord that connects the two earbuds is textured in a way to make it less likely to snag, it still catches on occasion, and when it does, one of your earbuds will tug loose. Additionally, the cable bounces annoyingly when you run on a treadmill.